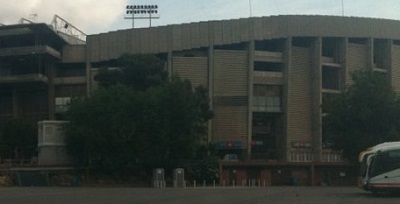 The stadium, formerly known as the Estadi del FC Barcelona, was one of the 1982 FIFA World Cup venues. It hosted the opening match of the 1982 FIFA World Cup, which was won by the national football team of Belgium after defeating Argentina. Erwin Vandenbergh scored the only goal of the game. The stadium is among the largest sports venues by capacity in the world. In 2016, it hosted a rugby union match with 99,000 people in attendance, which became a record attendance for a rugby union match in Spain. The venue is the home of FC Barcelona, the second sports team in the world with 100 million followers on their main social media page. In 2010, they created history when three players who came through its youth academy (Messi, Iniesta and Xavi) were chosen as the three best football players in the world. 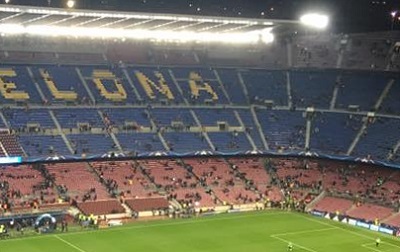 FC Barcelona won the UEFA Champions League, the European football championship for clubs, three times between 2006 and 2011. FC Barcelona, nicknamed Barça, became the first football club to win the FIFA Club World Cup three times. Their arch-rivals Real Madrid became the second club with three FIFA Club World Cup titles. The fierce rivalry between FC Barcelona and Real Madrid is world famous. Any football match between the two giants is known as El Clásico. The matches between both clubs usually are among the most viewed annual sporting events. El Clásico is sometimes identified with opposing political positions, with Real Madrid viewed as representing Spanish nationalism and FC Barcelona viewed as representing Catalan nationalism.